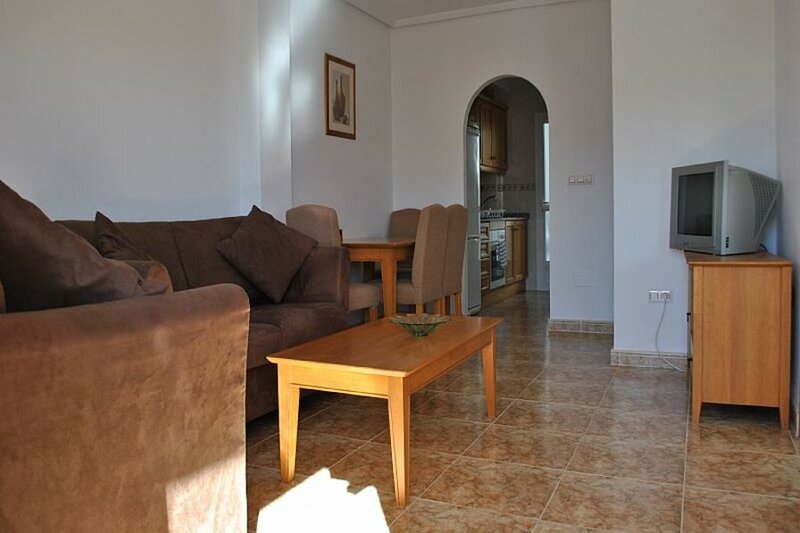 Very nice first floor apartment on La Cinuelica R3. Close to local amenities and the Punta Prima beach. Ideal for couple and families alike. This 2 bedroom first floor apartment located at the popular Residential La Cinuelica, R3 -Los Altos, which is a 10-15 minutes walk from the beach, 10 minutes walk to the local supermarket (Consum) and within 15 minutes walk of bars and restaurants. The town and marina of Torrevieja is a 10 minute drive away. The apartment is on the first floor and there are no other apartments above. Upstairs is a private roof top solarium to enjoy the Spainsh weather from. The living/dining room has two comfortable sofas, sideboard unit with television and a DVD player (please bring your own DVD’s), wooden coffee table and dining table, four chairs and pictures. The windows look out to the front of the property which has a balcony overlooking the communal swimming pool. the apartment is air-conditioned throughout. The fully fitted kitchen has a fridge freezer, electric oven and hob, washing machine, toaster, kettle, crockery, cutlery and cooking utensils. The kitchen has a window looking to the rear of the property and a door leading to the outside galleria area which contains the washing machine and steps that lead up to the private roof solarium. The main bedroom has a double bed, fitted wardrobes, and 2 bedside cabinets with drawers, pictures and duvets for the winter. The second bedroom has 2 single beds, fitted wardrobes and a bedside cabinet with drawers. The fully tiled bathroom has a bath, over the bath shower, shower curtain, bidet, and toilet, sink, mirror with lights and a window. The property has use of a communal swimming pool which is located to the front of the property along with the large landscaped garden. Walking distance from the property you have several supermarkets including: Consum, Carrefour, Lidl and Aldi. There are many bars and restaurants within walking distance, there is a selection of commercial centers, with a wide selection of bars and restaurants, providing ample choice with many cuisines available. Punta Prima is a mere 5 minute walk away, Patio Andaluz is a Spanish restaurant with lots of atmosphere and flamenco dancing 2 nights a week. The Punta Prima restaurant is a sea front restaurant with stunning views, serving Tapas or Spanish La Carte menus. Las Habaneras shopping centre located in Torrevieja just a 10 minute drive away, it’s a 3 story open air shopping centre and is home to clothing / sport shops (Inc Zara & H&M), perfumeries, Game, hardware shops and many more. Ample parking is provided, the first hour is free. The Ozone entertain complex is just across the road, with a casino, ten pin bowling and restaurants.